The details of a hidden self-portrait by celebrated Australian painter Arthur Streeton have been revealed in a new collaboration between art and science. The joint investigation will encourage further use of synchrotron techniques for studying artists’ materials and methods, assisting art restorers, and providing new evidence in cases where the identity of an artist is unclear. Now owned by Streeton’s grandson, Oliver Streeton, the work in question was painted on a prepared canvas but later covered over with white lead paint by the artist. Towards the end of his career, Streeton often painted over earlier canvases and re-used them. In this case the canvas was not re-used, but instead remained in the artist’s studio where it gradually accumulated layers of dust and even the occasional cat paw print. The hidden self-portrait was visible as a faint image behind the white paint, but the details were impossible to distinguish. 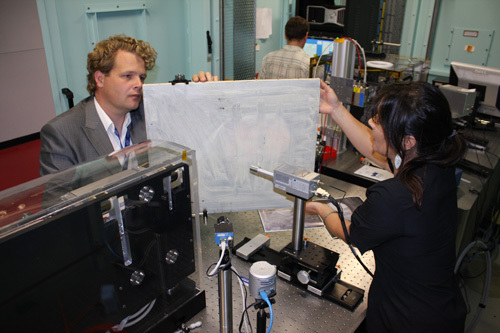 David Thurrowgood and Deborah Lau (CSIRO) used the x-ray fluorescence microprobe (XFM) beamline at the Australian Synchrotron in early 2010 to examine the Streeton work, with permission from Oliver Streeton. Synchrotron techniques are well-suited to examining works of art because they are non-destructive and can rapidly provide detailed information on the chemical composition of different constituents. Researchers can use the XFM beamline to scan across an entire canvas section by section, collecting detailed chemical information as they go. The beamline can also provide a ‘fingerprint’ of the elements that are present in different pigments. Most current examination methods involve taking small cross-sections, which damages the artwork. Laboratory x-ray techniques don’t require cross-sections, but are unsuitable in this case because lead strongly absorbs x-rays, swamping the signals from other, lighter elements. At the synchrotron, the detrimental characteristics of lead are minimised with judicious choice of the incident monochromatic beam energy, allowing researchers to focus on the x-ray fluorescence of the other elements in the painting. David and Deborah had previously studied the painting using x-radiography and infrared reflectance techniques, but the synchrotron XFM beamline offered much higher spatial resolution. Image: David Thurrowgood (NGV) and Deborah Lau (CSIRO) position a painted-over Streeton self-portrait for analysis on the XFM beamline at the Australian Synchrotron. Behind them, Daryl Howard (AS) checks the alignment of the x-ray microprobe.